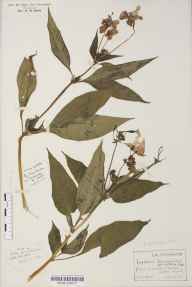 The website of the Botanical Collection Managers Group (BCMG), a specialist group of the Linnean Society of London. Welcome to Herbaria United. This is the site where the herbaria in the UK and Ireland are working together to provide an on-line resource for anyone interested in plant collections. This site provides links to on-line UK herbarium resources and contains lots of useful information. There are on-line gazetteers, a handwriting query page, systematic look-up lists (e.g. Kent's List of Vascular Plants of the British Isles) and a collaborative database which ultimately aims to combine the data from all UK and Irish herbaria. We are keen to encourage everyone with a herbarium to become involved with the group and the website. The herbaria of the UK and Ireland house over 20 million specimens. These date from as far back as the 16th century to the present day. The collections cover the entire globe and reflect the exploration of the world and the rise in the study of natural sciences. They include specimens from early explorers such as Joseph Banks and Charles Darwin, the later extensive collections of Victorian industrialists and collections from modern day biodiversity based expeditions and studies. A herbarium sheet is first, a preserved sample of the plant itself and second, a historical document. It is this latter aspect which is unique. Herbarium material provides a time-line and it is a time-line with a genetic component. Biological and evolutionary studies depend upon having collections that have genes, chemicals etc. and mostly these are derived from living material. The herbarium specimen is the only repository of historical genetic information. This is illustrated by Cochlearia danica which shows a changing distribution of trichomes on the leaf surface. When plotted against concentration of carbon dioxide it is revealed that an increase in CO2 changes the distribution of trichomes. This is only possible to demonstrate using herbarium material collected over a significant period of time. Follow this link for 100 uses of herbaria.